A couple of weeks ago, I talked about my toilet getting clogged and I said when your toilet is working OK, you take it for granted. 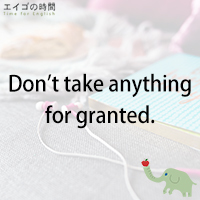 Today, let’s focus on this idiom “to take something or someone for granted”. If you take something or someone for granted, you expect that they will always be there when you need them and never think how important or useful they are. As a result, you fail to appreciate as much as you should. Actually, we take a lot of things for granted, like clean water, safe food, air-conditioning. We often take our parents or their love and devotion for granted, especially when we’re young. After all, if you take things or people for granted, you are not grateful enough. Personally, I can no longer take it for granted that my toilet works. Every time I see my toilet flush properly, I thank God! 2. you don’t need them. 3. you don’t appreciate them. Previous Post ほんとにうんざり – I’m really fed up with this.